Max has taught me many things in his almost 7 years. He's taught me to laugh, and enjoy the little things in a day. He's taught me unexplainable, unconditional love. And...he's taught me that when you're body is tired, you must rest. He had a few seizures in the early morning...and as they were getting on a cycle, we had to give him his rescue seizure medicine...which knocks him smooth out. It will be a quiet day around here...but maybe it's just his way of telling us we all need to just relax and rest today. I hope his rest leaves him refreshed. He looks so peaceful in those photos. He woke up about 3:45 this afternoon...he's been awake the rest of the afternoon, but still feeling groggy. 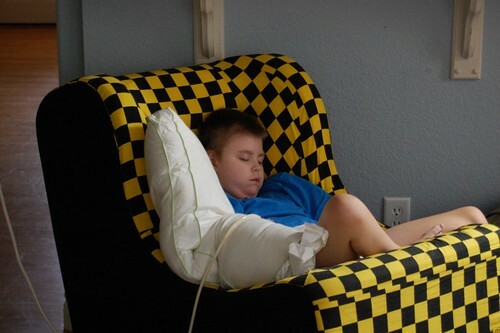 It is so good for him to get recharged and the extra rest! 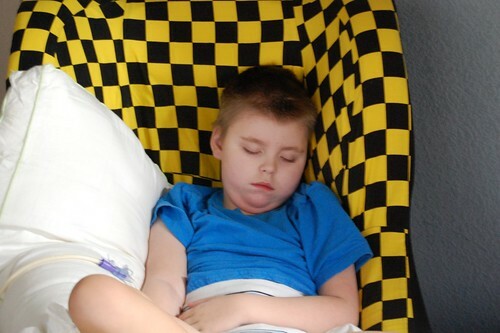 He looks so comfy in his chair, sometime we all need to recharge.